Here is my latest project being the Mamod SE3 Griffin & George steam engine. 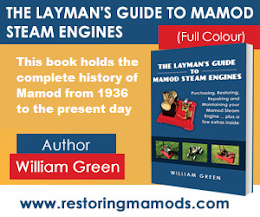 For all those that don't know, Griffin & George asked Mamod to make custom designed SE3 steam engines to be used for educational purposes. They look very similar but I think (not totally sure) the differences lie with the whistle and all the soldering is silver. Either way, there were only 2,000 of these engines made making them extremely rare! I have said in a previous article that the best place to buy Mamod steam engines is on eBay. However, if you don't want to be constantly outbid, try Preloved.com. Although most of the engines are overpriced, there are still a few bargains such as this SE3 Griffin & George engine at just £45 with burner! At both the safety valve, water plug and pistons, steam was escaping at a rate of knots. This is mainly down due to the lack of being steamed up for a long and dirt preventing air tight seals. However, it also makes clear the safety valve and water plug needs new rubber washers. From first glances at the engine, I think everything needs a good clean and repainting. I will keep you updated with it I hope going through main areas I feel it is important to restore. If you want to take something away from this article, make sure you check out Preloved. Just search for 'mamod' and there will be engines that are there for sale. Good luck in getting one!